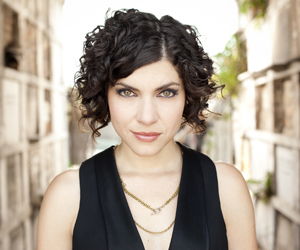 Carrie Rodriguez is a prodigious fiddler, a soulful singer, and a probing songwriter. Lucinda Williams said of her in the New York Times says, “She’s got something unique in her voice that’s very subtle and a little smoky and sweet.” Carrie has released five albums with veteran songwriter Chip Taylor, one with Ben Kyle of Romantica, and six solo albums, including her newest, Give Me All You Got, recorded in Berkeley at Fantasy Studios. She’s worked with Rickie Lee Jones, John Prine, Mary Gauthier, Alejandro Escovedo, and Bill Frisell, and appeared on A Prairie Home Companion, Mountain Stage, and Austin City Limits. Her music is emotional, direct, and full of spirit. She’s joined tonight by guitarist Luke Jacobs of Romantica, with whom she co-wrote two songs on the new album. Carrie grew up in Austin, Texas, the daughter of songwriter David Rodriguez. After sitting in on a sound check with her father’s friend Lyle Lovett, she switched from studying classical violin at Oberlin to fiddle at Berklee College of Music. She says her teacher, Matt Glaser, and her fellow students, including roommate Casey Driessen, helped her, “let go of that wall I had put up as a classical player.” Another turning point came when she met Chip—who scored huge hits in the 1960s with “Wild Thing” and “Try Just a Little Bit Harder”—and they started touring together. “From working with Chip I learned that when you can just be open and not analyze, that’s when the truth comes out.” Hear Carrie tell the truth tonight and feel the sad joy and patient hope that fill her new album.